Alex Boardman (@A_Boardman) previews Dillian Whyte v Joseph Parker and provides us with his best bets for Saturday’s Heavyweight-boxing clash at the 02 Arena. After dropping his WBO heavyweight title and undefeated record to Anthony Joshua back in March of this year, Joseph Parker takes on another stalwart of British Heavyweight boxing as he faces Dillian Whyte at the 02 Arena this weekend. The bout marks the third consecutive fight on British soil for the New Zealand native, and also sees him headline his second PPV bout under the Sky Box Office & Matchroom banners. Although he lost, many people were impressed with Parkers performance against Joshua, even though the bout was ultimately a tame affair. This fight against Whyte offers him the opportunity to catapult himself back into contention with the 3 top names in the division, and makes him a feasible option for Wilder, Joshua, and Fury depending on who fights whom over the next 12 months. The same can be said for Dillian Whyte, who, after campaigning hard for a fight against the American champion Wilder, has landed himself the perfect opportunity to ensure he has a say in how the Heavyweight division plays out. Whyte comes into the fight on the back of a superb KO of the formerly undefeated Lucas Browne, and the Jamaican born Brit will be riding a huge hometown advantage. Parker is undoubtedly the better technical boxer of the two men, and he has also shown he has a solid chin on him from the Joshua fight. Still, Whyte posses the sort of power that can separate any man from his consciousness with one shot, and is a dangerous customer from the first to the last round. 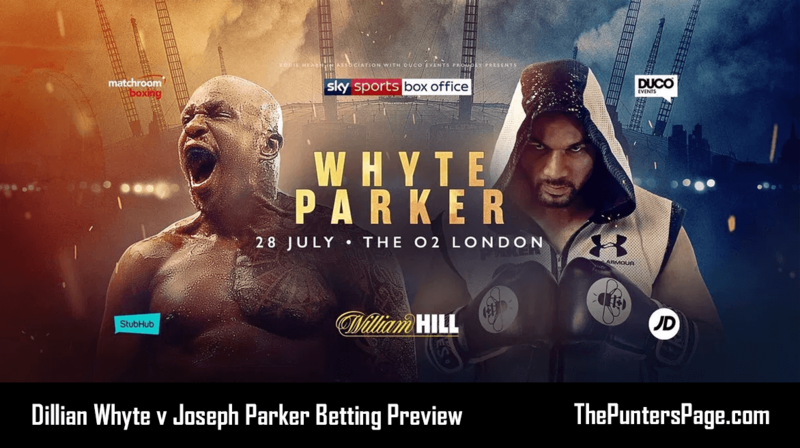 I don’t think this is the sort of fight where it is an either or outcome, as Parker’s volume may begin to overwhelm Whyte in the latter rounds, and Whyte could win by making this a scruffy affair from the get go. This will be a close fight that is reflected in the betting prices, and a win for either man will catapult them back into the Heavyweight title scene with the big boys. I see this being a close fight which Parker should edge due to the technical advantage he hold over Whyte. His jab should dictate when and where this bout takes place even with a slightly shorter reach than Whyte, and I expect him to take a decision by a 3 or 4 round margin.